Finally! it’s happened. An attorney feels that the U.S. federal government and Big Pharma must be sued and taken to task legally for their liability in causing false and inaccurate information about vaccines to be disseminated upon which FORCED vaccinations are based, including health damages that have resulted to infants, toddlers, teens (adults, too) from those forced vaccinations. Attorney Deal’s legal opinion is one that I have held for numerous years. Why has it taken so long for someone to decide to act upon the violations of public trust and the breach of social contract, if citizens of the USA are supposed to live in a free society? Where are our rights of self-determination? Do children belong to their parents, or to the state? Good questions? The answers to my questions probably can be found in Attorney Deal’s realizing that something has to be done in Washington State regarding the overbearing mandatory vaccine agenda. 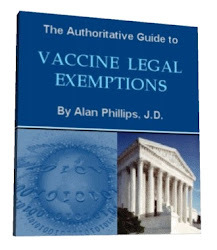 Deal prepared a report, which can be read here wherein he lists many of the “mea culpas” involved with regard to vaccines, vaccinology ‘science’, fraud and deceit, and apparent collusion between federal agencies and Big Pharma. Personally, I feel it’s more than lazy language; it’s criminal since no vaccines have been tested for their abilities to cause cancer, birth defects, or interfere with reproduction or fertility! Furthermore, with all the animal viruses that have been found and acknowledged in vaccines over the years, which I talk about in my book Vaccination Voodoo, who knows what type of diseases are being spawned by vaccines given to children within 24 hours of birth? 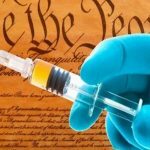 With overly dramatic increases in the rates of autism, ADD, ADHD, childhood diabetes, and other chronic “old-age-type” diseases for children since the ramp up of mandated vaccines, it is incumbent upon society to take federal and state agencies, plus Big Pharma and vaccine makers, to task and exercise the basic human right to self-preservation when faced with threats to our health, well-being and children. The last sentence above is paramount as to why vaccines must be declared unsafe! Science, medicine, or government should not mandate injecting into a pregnant female something that has not been proven possibly to harm her fetus! That unconscionable ‘edict’ alone should be brought as criminal charges under the Nuremberg Code , as those vaccines are experiments not tested for safety. That and much more—like the toxic ingredients and what they do in the body from peer-reviewed studies, I discuss in my 2013 book, Vaccination Voodoo, What YOU Don’t Know About Vaccines, and to which I’d like to add another subtitle, “And which you should know before it’s too late”. I congratulate Attorney Deal for what he’s doing in Washington State and encourage every attorney to take a similar legal position in each of the 50 states, plus file a class action lawsuit against the federal government agencies involved with pushing dangerous vaccines together with their manufacturers and Big Pharma.